The 2005 US Western Regionals, a main focus of the season for US clubs not part of the MAAFL or EAFL, has seen the Denver Bulldogs again stamp their authority on American Aussie Rules footy. 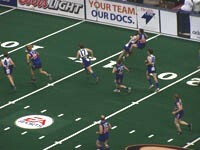 They've also released footage of their demonstration game at an Arena Football League match. Round 1 of the series saw Orange County, San Diego, Golden Gate and Arizona travel to Colorado to take on the Bulldogs on their home turf. The first day was traumatic for organisers, with heavy rain resulting in grounds being unavailable. Fortunately an alternative was found and the matches were transferred to an hour south, in Colorado Springs. As is often the case, some of the sides struggled to get all their best players to travel, and this showed in the results. It's tough to know how much of an effect that was, and how much is due to Denver raising the bar. Certainly Denver are the dominant side in the USAFL, having won 4 of the last 5 Nationals. But the results were very lop-sided, with Denver smashing Arizona and San Diego on the Saturday. In the other games Arizona won narrowly over Golden Gate, who earlier in the day had snuck home against OC. The big strugglers were San Diego, who also lost badly to OC. Better weather saw Sunday's matches return to Denver, but the Bulldogs didn't ease off, crushing OC and Golden Gate. OC defeated Arizona, who also thumped San Diego, as did Golden Gate. At the end of tournament, Denver finished with 4 wins 0 losses, Orange County 2-2, Golden Gate 2-2, Arizona 2-2 and San Diego 0-4. It looks like the second and final round (probably to be played in Vancouver, Canada) will be a battle between three teams to earn second spot in the west. Seattle also sent players to the tournament but were unable to field a full squad. It will be interesting to see how discussions went on formalising into a western league. From the outside at least, as much as it would be great to see such a league in the near future, it seems the clubs don't have the numbers required to travel with strong squads on a consistent basis. But hopefully some organised structure will emerge. Full results can be found at the Denver Bulldogs Western Regionals page. On their front page you'll also find a link to video of their recent demonstration match at the Pepsi Center in Denver, where they played a reduced numbers exhibition game at half time of an Arena Football League match. This is becoming an increasingly common way of promoting Aussie Rules in the US, and for packaging the game, sure looks better than parklands matches. It gives a small taste of where the game could go in the US in years to come.